The hype surrounding Kobe Bryant’s return has dissipated, and the Lakers are still without a win since his return. They will face another tough test on Friday night as they head to Oklahoma City to take on the Thunder. 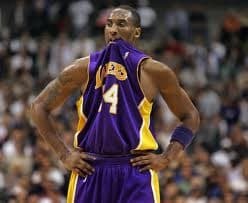 Bryant’s return has been overshadowed by Los Angeles’ losing ways, but Kobe has not looked like himself so far. He missed all but two shots in a loss at Toronto in his debut game but did finish with 20 points on Tuesday’s 114-108 loss to Phoenix. The defeat gave the Lakers a 10-11 record on the year and with news that guard Steve Blake will miss six weeks with an elbow injury, Bryant will be forced to play more minutes, some at the point guard spot. LA is currently without any healthy point guards with Steve Nash and Jordan Farmar still both sidelined. It could be a learning curve offensively for Los Angeles, but their defense also needs some work, as well. The Lakers have given up an average of over 106 points per game over their last seven games. Their opponents, the Thunder, have won 12 out of their last 13 games and have averaged 111.0 points per game during a four-game win streak. Their last victory was a 116-100 drubbing at Memphis. Russell Westbrook led all scorers with 27 in that contest while dishing out nine assists. This is a mismatch of epic proportions and the betting public has noticed. The line for this game opened at -11 and has moved to -13 before 11 am. Jump on this one now if you are backing the Thunder because it may keep moving the wrong direction. Kobe is no doubt still struggling physically and has slowed down the Lakers offense to a crawl when he is out on the floor. Now, he will be running the point. This is a disaster waiting to happen. Their disjointed offense has just gotten worse. Making matters worse for LA, the Thunder have been much stronger defensively as of late and have yet to lose a game on their home floor where they are 10-0. They are one of the highest scoring teams in the league and score even more points at home. I like OKC to win big. Fresh off a win against the defending champion Miami Heat, the Pacers welcome the Charlotte Bobcats to Bankers Life Fieldhouse on Friday. What can I say about the Pacers that has not already been said? This team is currently the NBA’s best squad, and they proved that with a gritty win against Miami on Tuesday night. Indiana held the Heat to a season-low in points and forced them to work for every shot. Indiana is the league’s best defensive team, surrendering just over 89 points to opponents. Indiana forward Danny Granger may return tonight and upgrade an already potent offense for the Pacers. He has been sidelined all-season with a strained calf but may play limited minutes tonight. The Bobcats are another defensive powerhouse, surrendering just 92.4 points to opponents, good for second in the league to Indiana. However, they are the league’s lowest scoring team, averaging less than 90 points per contest. They struggled again on Wednesday losing to the Orlando Magic 92-83, which snapped a two-game win streak. The total is extremely low in this one, but I think that is more of a reason to take the under. I could easily see Indiana holding the Bobcats to under 80 points, and the Pacers will not be lighting up the scoreboard either. This game may be one of the lowest scoring contests this year. The Knicks head to Boston looking to avenge a defeat that was the most lopsided game in the NBA this season. The Celtics took care of New York handily last Sunday. They scored the first dozen points of the game and never looked back in route to a 114-73 victory. Boston shot over 54 percent in the game. New York is averaging just less than 94 points per game, one of the lowest averages in the league. Carmelo Anthony has done his best to keep the Knicks afloat by averaging 25.6 points per game, but for the most part, it has not helped in the win column. New York beat the Chicago Bulls on Wednesday in a low-scoring affair, 83-78. They barely managed to hang onto the win after nearly losing a 23-point lead. The Celtics have lost two games since winning against New York on Sunday, but have played better as of late. They are 3-2 in their last five games and have a 10-14 record heading into this contest. Boston lost an emotional game on Wednesday against former coach Doc Rivers’ L.A. Clippers on Wednesday, 96-88. As bad as the Knicks have been, this is a terrific spot for them. There is no doubt they will be heavily motivated in this game to take revenge against the Celtics. Boston has been overachieving for weeks.